The fashion runways of fashion weeks from different parts of the world are all talking – street style. The style setters are having themselves clicked away by photographers. Street style fashion seems to have set in and the trendsetters are flooding their blogs and social websites with cool pictures of what street style is according to them. Bloggers across the globe have added posts on street style fashion. There is not one or two but hundreds who look forward to being trendsetters but there are some that are noteworthy and those that can be bookmarked so you can follow their styles and improvise in your style accordingly. Here is a list of 20 most happening blogs that will show you what street style fashion is all about. From what you need to wear in between weathers or what you need to slip in while you go out sigh-seeing, this blog is a perfect guide for that. Julie is a master of street style dressing and there are some impressive pictures which not only tell where you can buy what she is wearing but also shows how different girls are and they wear the same thing in different ways. Clothes and accessories she has you covered and will show you what is trending and what is not. Tamu started by writing for Vogue Pelle and slowly became a contributor at Elle Italia. She has also contributed to some of the known publications like Refinery 29, Galmour U.S Metro and Harper’s Bazaar U.S . There is a dedicated section for street style in her blog where she has adorned her gallery with some stunning streetwear. The presentation is commendable and a must bookmark for all the street fashion lovers. The blog was started by Scott Schuman in 2005. Sartorialist soon gained popularity and people have since been digging into the blog to look for inspiration for street fashion. Time magazine had included Schuman’s name among the top 100 design influencers. Schuman’s pictures are pretty simple and mostly include common people who are well-dressed and can be spotted in the streets of Europe and New York. Neither quirky nor complete labels is what you should expect of Schuman. You can find every shade and every type of color on Rachel’s blog. Besides fashion, her blog also features posts for home décor and shop where you could buy some of her featured looks. She mentions where she has bought. Rachel has come a long way and she completely understands fashion. She knows her way to work magic with needles, threads, and fabric. Her blog is vibrant and her street style cannot be missed. Paris is known for its labeled fashion. Fred tries to capture random fashionable people through his lens. Follow his blog to see what the city of lights has in store for you. Garbage Lapsap was founded in 2010 by Nicholas who is a photographer and likes to study people around him and how they inculcate style into their daily routine, this also lead to designing his own website based on street style fashion. His website has been listed by ‘The New Yorker’ as one of the 14 international blogs to check out. Esquire, GQ and ELLE have commissioned him to capture street style fashion weeks across the globe. He also collaborates with brands to take on photography projects. His blog is truly outstanding and truly depicts street style fashion. Finnish born Sandra loves heels and dressing up. Her blog is considered to be one the UK’s top blogs. There are thousands of viewers who take inspiration from her sense of dressing and follow her fashion tips. Sandra blogs about lifestyle, fashion, luxury travel, and beauty. Street style fashion is among one of the many styles she has in her closet. There is an inimitable sense of fashion in Sandra’s style and you are going to go crazy with the way she carries street style fashion. Every picture that Sinding clicks is original and of high quality. His catches are images of people from across the cities and the fashion they follow. He also photographs Fashion Weeks across the globe. Mr. Newton is from North Carolina but is based in New York. He loves street style photography and thinks that it has a coverage quality about it. He travels a lot and also loves to shoot random people from the street. His blog features some wonderful clicks of street style fashion. He has features some cools shots from indoors and says how street style can not only be outdoors but indoors too. Yvan is mostly spotted in fashion and cultural events that take place throughout the world. The Swiss photographer is a face well-known in the world of street style fashion. He is also known as Face Hunter and his blog goes by this name. Yvan has worked with Esprit, Armani, and Volvo. His picture gallery is vast and has pictures of some authentic street style fashion that is worth checking out. Yet another blogger and photographer who is obsessed with broad knowledge of fashion – Tommy Ton’s shots are detailed and expressive. He picks clothes and styles them in a way that it becomes the trend for the next season. Karen grew up in London and knew where to find herself the stylish clothes, accessories, and shoes. She wanted to make these pretty boutiques known to everyone. Nothing fascinates her more than locating a hidden store where you can shop for the latest trends. There is a range of pictures in her gallery that reflect some chic fashion. Bubbly girls walking, listening to music, walking to work is what you will find in her pictures. She is natural and an ultimate blogger to follow for the best street style fashion. This street style blog is from Helsinki and features very simple looks of common people from Helsinki. The fashion is interesting and intriguing. Every picture clearly speaks of how comfortable the fashion that they have worn is. 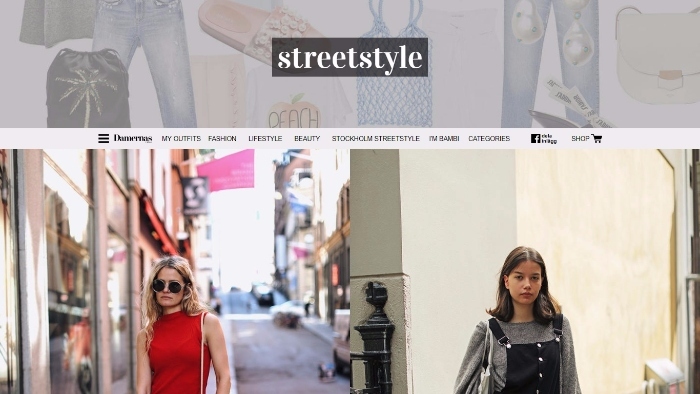 This is a pure street style blog which focuses mainly on fashion, lifestyle, and beauty. When it comes to costumes there are lots of styles to follow and some pretty fashion methods to wear and show off too. Basically, you can find all those on this blog with clear-cut perfection. This duo is always on the streets looking for flea markets, haggling and hunting for cheap yet good-looking clothes. They are fashion junkies and their inspiration for fashion comes from the people around them that are creative. Street Peeper is one of the most influential street style fashion blogs that you can come across. Phil is a contributor in Vogue.com(US) and international magazines like Elle China and Harper’s Bazaar Australia. He travels around the world and blends his pictures between random people, industry insiders, dudes on the street and eccentric street kids. He is presently based in New York and his blog has some mind-boggling wonderful street fashion you can’t miss to see. Inspired by street style bloggers from across the world the two friends decided to launch Streetgeist in 2008. Streetgeist was the first blog of its kind in Greek and the people simply loved it. The company now operates from Los Angeles, California. The trends depicted are beautiful and takes street style fashion to a whole new level. Although Wayne Tippets has been fascinating the world with his mesmerizing pictures since 1980’s, his blog on street style shopping has been up and running since 2008. Wayne’s photography is considered to be one of the best. Every style photographed is different and fresh. Street style Aesthetics is a must stop by so you can see what Tippets has in store for you. As the name says the blog captures the essence of Berlin. Mary Scherpe also includes food, home décor, local food, art and culture besides street fashion in her blog. Candice is an Australian born blogger who is based in London and is a photographer, model, and a designer too. Candice is a Contributing Style Editor at Vogue. She has walked the international ramp for Chanel, Louis Vuitton, and Fendi. TRESemme named her global ambassador in 2013. Her fashion label is ‘Candidate by Candice Lake’. There is a dedicated section for street style in her blog that reflects her versatility. You also have the option to shop the look.